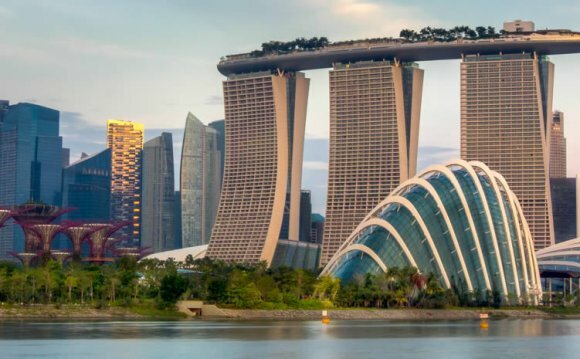 Singapore officially the Republic of Singapore, is a Southeast Asian island city-state off the southern tip of the Malay Peninsula, 137 kilometres (85 mi) north of the equator. An island country made up of 63 islands, it is separated from Malaysia by the Straits of Johor to its north and from Indonesia's Riau Islands by the Singapore Strait to its south. The country is highly urbanised with very little primary rainforest remaining, although more land is being created for development through land reclamation. Singapore is the world's fourth-leading financial centre, and its port is one of the five busiest ports in the world. Slightly over five million people live in Singapore, of which 2.91 million were born locally. The population is highly diverse; the majority are Chinese with almost 75% of the total population, while Malays and Indians forming significant minorities. Reflecting this diversity, the country has four official languages: English, Malay, Chinese, and Tamil. Avid golfers can expect nothing less than world-class golf courses in Singapore, with over 20 courses and driving ranges that cater to both public and exclusive members. Courses, each carefully designed to deliver a spectacular experience.